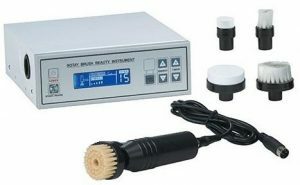 item #SDS811.“A Brush Unit Machine with Brush Set that is perfect for cleansing, rejuvenating, and exfoliating the top layers of the skin. This rotary brush with accessories offers you control and accuracy for gentle exfoliation and delicate stimulation that will give your client a radiant complexion. The purpose of the peeling is to slough off the dead cells, and to remove any dirt and grime that clings to the surface of the skin. Before any peeling is done, the skin is cleansed with either viscose sponges or cotton pads. The face is diffused with vapor or steamed with warm moist towels to soften the dead surface cells so that they can be more easily removed.please note,all shipping charges are additional and will only show up on your invoice from us.this will not appear on your internet order.